Embarque em uma caminhada de vários dias até Machu Picchu, saindo de Cusco ao longo da trilha Salkantay Trek, uma alternativa menos lotada, embora apenas espetacular, à Trilha Inca. Com cavalos para transportar o seu equipamento, você começará sua jornada de 4 dias na cabeça da trilha Soyrapampa, cruzando o ponto mais alto da sua caminhada - o caminho Apacheta de 15.590 pés de altura (4.590 metros) - na sua ascensão inicial. De lá, você passará dias vagando pela selva exuberante e passando por cachoeiras jorrantes, ao lado de plantações de café de aldeias e através de prados de alta altitude e acampando durante a noite sob as estrelas antes de chegar à famosa cidadela inca. 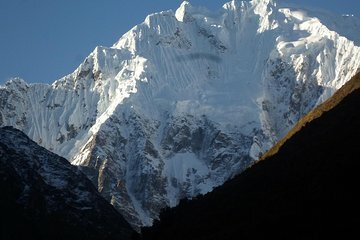 Earlier this month, my husband and I did the short Salkantay Trek in four days. Tierra Vivas provided a fully-supported, professional experience. I cannot recommend them more! - Adner is very knowledgable guide, and he was patient with my pace when the altitude would slow me down. - Silverio cooked hearty, delicious meals - you will be well fed! Roberto did a great job getting the mules and horses to each destination. - Each campsite was clean the camping equipment in great condition. - Yolanda did our briefing in Aguas Calientes. We happened to leave our Machu Picchu passes behind at the briefing and she saved them for us! We got lucky they weren't lost. - It was be extremely hard and rewarding. Do it even if you're scared! The views are impossibly beautiful. - Accept help and rest when you can. I ended up renting the emergency horse, and taking the train to Aguas Calientes. - The altitude will make every step feel like you're running a marathon. Bring electrolytes and ibuprofen. - Exercise a lot in advance if you can, if not, there is enough support to get you to Machu Picchu! My Wife and I went for a just over a week to Cusco and booked this tour to take us to Machu Pichu. Entrance to Machu Pichu was included, along with food and accommodation for 3 days. This trip is definitely not for the faint hearted. I wouldn't consider my wife and I to be unfit by any stretch - in fact I am a serving police officer in the UK so have to maintain a certain fitness level to do my job. However we both found this trek challenging. Expect around 8 hours walking every day, both up and down hill, at quite steep gradients and altitudes of 3000-5000m. The approach to Machu Pichu Town a tourist town at the base of Machu Pichu mountain is along the railway track and runs alongside a river, so be prepared for mosquitos and bring insect repellent. Despite the harsh terrain both my wife and I enjoyed it and Machu Pichu itself was superb. The food each day was a little bland for our tastes, but was traditional and had that homecooked feel. Our guide, Ali-beth, was knowledgeable and friendly. Although she said the tour can have as many as 12 people on it at times, when we were on it was just the two of use, Ali, the porter and the cook. Ali was able to react to our wishes when we asked to visit a local hot spring for some RR along the way although there were additional costs for the hot spring itself and my only quibble would be over the way she motivated us by continually telling us that the destination was just around the next bend or only a few more minutes away. This was a beautiful trek with a wonderful guide and service. However, booking in Cusco is 200-300 dollars cheaper than booking online with Viator. Beautiful tour. We had purchased a tour for 4 days and 3 nights and were placed with a group doing 5 days and 4 nights. This left some complications and some independent travel for our final days but was managed by the team.